In 2013, Ouest-France launched L’édition du Soir (EdS), the first digital-only daily publication in France. It was initially conceived as an experimental tool to innovate in the emerging digital news market. Now, L’édition du Soir is neither a baby, nor a lab product. It has become a vital part of Ouest-France’s overall digital strategy. Present on the Web and through native Android and iOS apps, L’EdS reaches more than 1.8 million unique readers each month. 90,000 recurring users are reading the digital evening newspaper at least three times a week. 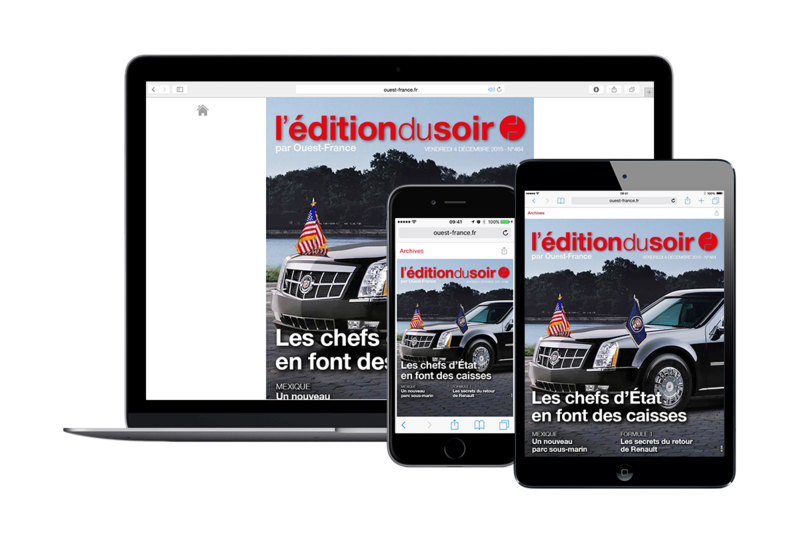 To enable this growth, L’édition du Soir has introduced Freemium access, coupled with dedicated audience activation via social media, newsletters, etc. With the Freemium model, anonymous users can read a limited amount of articles. After a few pages, it is proposed to register to read more. The next step is the monetization of this registered audience. Driven by the desire to improve the user experience for 70% of the readers, we developed the WebApp Touch together with Ouest-France. L’Edition du Soir, already available on web for desktop users and on native tablet and smartphone apps, is now ready as a Twipe WebApp Touch. Discover it now on your mobile device. With 750,000 print readers a day (amongst which 550,000 subscribers) and a reach of 2 million readers each day, Ouest-France is the biggest-selling daily newspaper in France. In addition to print, Ouest-France also offers digital products: a free news website, as well as mobile and WebApps, launched in June 2012 with success. The website attracts around 900,000 unique visitors a day, becoming the ninth most visited news site in France. Mobile apps present their 53 regional editions to 51,000 paying digital subscribers.